Nearly twenty participating models walked the runway at the sold out Slay Tre event on Thursday, June 7, 2018. The show features and benefits young people like Ericka, who grew up in foster care and are on track to graduate college. 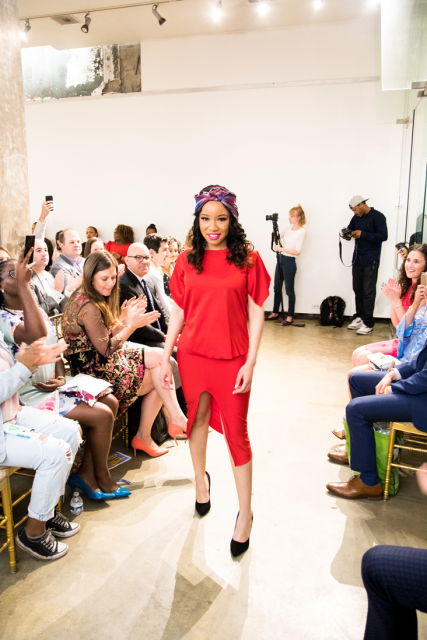 (Manhattan, NY)—HeartShare Saint Vincent’s Services (HSVS) hosted its Third Annual Fashion Show or “Slay Tre” featuring and benefiting youth in care on Thursday, June 7 at the Prince George Ballroom. Nearly twenty participating young people put on a beautiful and impressive show with the help of HSVS Youth Development and a team of over 50 dedicated volunteers for hair, makeup, and backstage assistance. The sold out show had an incredible impact on its participants. “I felt awesome. This is my second year participating and I’ll keep going until I age out,” shared one model Gamalier. The confidence learned in preparation of the show quickly become a part of the scholars’ personal and academic lives. The agency’s American Dream Program provides financial, career and emotional support, keeping 46% of its college-aged youth in care on track to graduate college. “This is the investment you’ll see a decade later,” said Melody Centeno, former foster youth, founder of Foster Care Unplugged and coach for the Slay Tre models. “Thanks to HeartShare St. Vincent’s Services, I went to Adelphi College, where I participated in a fashion boot camp. My self-esteem grew from the experience and hoped Slay would have a similar impact on our youth.” Melody’s daughter, Savannah, made an appearance on the runway too. 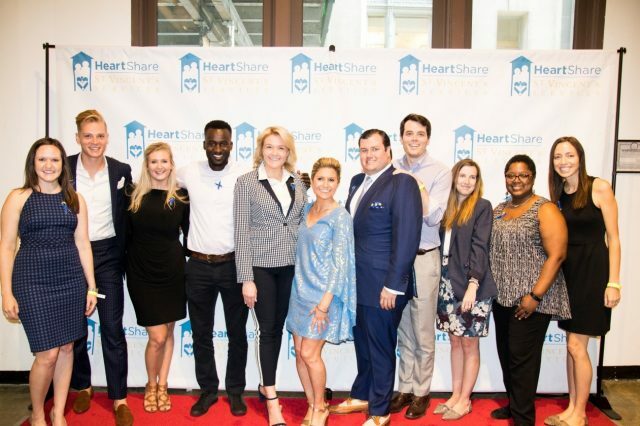 Slay Tre Fashion Show was made possible with a community of supporters, including sponsors, the Youth Development team and the HeartShare St. Vincent’s Junior Board pictured here. HSVS Director of Education Lauren Pettiette at center. “We needed to help our youth develop stronger self-esteem, which is paramount to becoming well-adjusted young adults,” shared Jermaine Smith, Associate Director of Youth Development at HSVS. “Through this experience, our young people can walk confidently into the uncertainty of adulthood,” he explained. “Throughout 12 weeks of rehearsals, youth connect with one another and build positive connections,” shared Donald Duggan, HSVS Youth Engagement Specialist. As a LMSW, Melody facilitated a therapeutic group session with the models after each Slay rehearsal. “We would get together and have a group discussion where we talked about issues, such as abandonment, rejection, displacement and conflict management,” said Melody. One model Alicia shared her reaction to the experience. “We all worked so hard for 12 weeks. We built each other up, let each other know what we needed to improve on and were great in the end. We are a family,” Alicia said with a smile. Designers dedicate their time and talents to generously create lines just for Slay Tre. “I made t-shirts that read ‘custom made,’ because I want our young people to know they are unique and that it’s something to celebrate,” said designer Chantel Gibbs, founder of Shannon Shenone. HeartShare St. Vincent’s Services Executive Director Dawn Saffayeh with Jayde Donovan, co-host of 95.5’s Todd & Jayde in the Morning. Donovan interviewed staff, supporters and the models before the show at Prince George Ballroom. The event also was made possible by Board Chair Ken Nolan, Board Member Chris Jones and avid HSVS supporter Maureen Moore. DJ Olivia Dope provided music for the evening. Junior Board Member Robert Serenbetz announced the agency’s 150 Giving Society, a monthly giving program. “A monthly donation of your choosing can help our young men and women stay on track to graduate college,” said Serenbetz. The program kicks off the agency’s 150th Anniversary celebration next year. 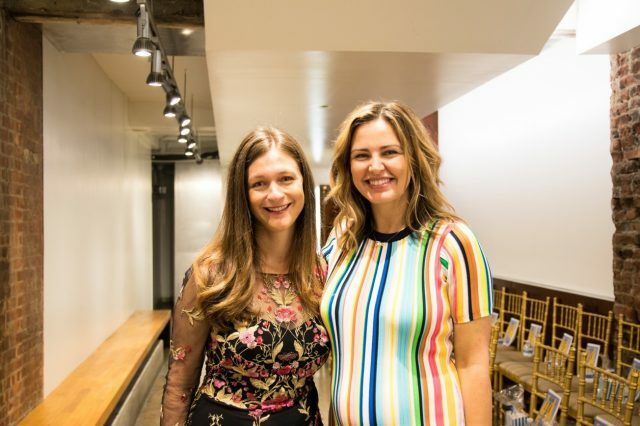 Correspondent Kirsten Fleming and 95.5’s Jayde Donovan, co-host of Todd & Jayde in the Morning, came out to support the event. They met and interviewed staff, supporters and models on the red carpet before and after the show. To give or to learn more about HeartShare St. Vincent’s Services, visit www.hsvsnyc.org.